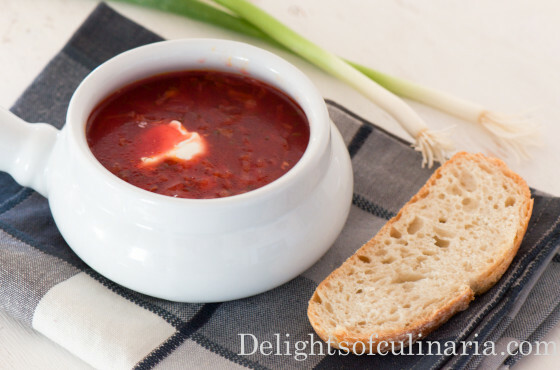 Borscht is a soup mostly made with beets and cabbage. It is a speacialty of Russian and Ukranian cuisine. It’s still a specialty in my family.There is lots of variations how to make borscht, but the base ingredients are cabbage and beets.Most of the time I can cook borscht without any meat or broth(believe me It’s still good) but sometime I would make it with homemade chicken or beef broth. Heat oil in large heavy pot on medium-high heat. Add garlic . When garlic starts to turn light brown add onions, carrots, and bell peppers. Saute for 7 minutes, stirring occasionaly. Add beets.saute for another 4-5 minutes. Add the tomato sauce,bay leaves and black pepper. Stirring few times,let it cook for 5 minutes . Throw in the potatoes and pour in water or broth. Season with salt,stir,close lid and bring to boil. When starts to boil reduce heat to low and cook until potatoes are done. Bring to a light boil and remove from heat.Tear chicken/beef in to small parts and throw in to the pot. It is best when served couple hours later.serve with dallop of sour cream , thinly sliced onions and bread. Optional: to cook Beef or Chicken stock; Bring water to a boil in a big pot,add whole chicken or beef (your choice of meat,ribs ). 1 whole onion and 1 carrot peeled.2 bay leaves and season with salt.cook for an hour on low heat or until chicken is soft and tender. It is best when served couple hours later. Serve with dallop of sour cream,thinly sliced onions/green onions/garlic and bread. Wow, beautiful pictures! I just found your site. I love the beauty of borscht. I just posted a recipe for borscht on my website and it’s amazing how different the prep can be. I think everybody’s borcht recipe is different. In fact, my borscht from week to week might even taste different! Borscht just has that reputation. Cheers from a fellow immigrant, Christ-follower, and mum-to-be.